FILE - In this photo provided by Renato Etac, Chinese Coast Guard members, wearing black caps and orange life vests, approach Filipino fishermen as they confront them off Scarborough Shoal in the South China Sea. A statement from China that daily civilian charter flights would serve the contested sea off its south coast raises the growing profile of civilians as a tool for governments to bolster their claims in Asia’s most widespread sovereignty dispute. The launch Thursday of flights from Haikou in southern China to Woody Island in the South China Sea, as reported by Beijing’s state-run Xinhua News Agency, extends Beijing’s broader campaign to build up the surrounding Paracel archipelago with military and other civilian presence. That expansion has angered rival Paracel claimant Vietnam. But the flights mark just the latest move among five governments to position civilians in the disputed sea of about 3.5 million square kilometers (1.4 million square miles). China, Malaysia, Taiwan, Vietnam and the Philippines have let nonmilitary people occupy some of the sea’s roughly 500 tiny land features to date. Civilians on site add credibility to sovereignty claims and deter any designs by one claimant to attack another, analysts say. “A human shield is probably an extreme way to put it, but if you have your own populations on these islands, it raises the political cost of conflict for anyone else who tries to take them over,” said Euan Graham, international security director with the Lowy Institute for International Policy in Sydney. Malaysia caught the first wave of attention for civilian use of the South China Sea in 1989 for opening its artificial Layang-Layang Island in the Spratly chain to tourists. Originally built for naval use, the island has a 53-room diving resort and gets direct flights from the Borneo side of Malaysia. About 200 people live on Taiping Island, the largest feature in the Spratly chain, to support the Taiwan coast guard. Taiwan has also flown journalists to the islet, which has a clinic and a solar energy system. Elsewhere in the Spratlys, the Philippines has posted about 100 civilians, along with military personnel, on the second-largest land feature Thitu Island, according to the Asia Maritime Transparency Initiative under U.S. think tank Center for Strategic and International Studies. Most of the civilians are civil servants and their families, the initiative says. China established Sansha City on Woody Island in 2012 and at least 1,000 people work there in fishing, paramilitary jobs and local commerce. Vietnamese people run schools, a clinic and military installations on their government’s South China Sea holdings. Both allow tourism, and China says the charter flights will further that cause. Civilian use of the islets shores up a respective government’s “effective control” under international law, said Oh Ei Sun, international studies instructor at Singapore's Nanyang Technological University. Other countries will see China’s civilian flights as a renewal of claims to the Paracels, he said, but less severely than a show of military force. The foreign ministry in Vietnam called Chinese flights to Woody Island “a serious violation” of Vietnamese “sovereignty” over the Paracels, according to the country’s online news service, VnExpress.net. 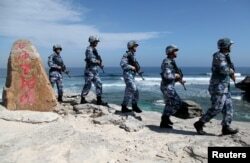 FILE - Soldiers of China's People's Liberation Army (PLA) Navy patrol at Woody Island, in the Paracel Archipelago, which is known in China as the Xisha Islands. Countries with stakes in the South China Sea value its fisheries, shipping lanes, and possible undersea reserves of gas and oil. Beijing’s expansion into the sea since 2010, plus its sweeping claim to about 95 percent of its waters, has put the other claimants on guard. Civilians often get sent to help military installations, however, and analysts believe China uses private fishing boats as a stand-in for patrolling waters disputed by other countries. Civilian access to the Paracel Islands may excite the Chinese public, said Graham, of the Lowy Institute. Chinese feel strongly about their government’s disputed claims to Tibet and Taiwan in part because they are occupied, he added. “Giving (civilians) direct access to these features is also a way of selling the message about importance of sovereignty to their own populations,” Graham said.